The Mantova hut is in the Gressoney valley ( Aosta valley) on Monte Rosa aglacier Garstelet. How to reach the hut? From winter 2009/2010 with the opening of the new lift “Passo Salati/ghiacciaio Indren”, reach the hut becomes easier and faster. From Gressoney, Staffal, you take the cableway for the glacier Indren. The first cableway bring you to the middle station of Alpe Gabiet (there is a bar- restaurant called Rifugio Lys) a few minutes from the Gabiet Lake. The second cableway bring you to direct to Passo Salati, where you can find the new lift to Punta Indren. From here you have to walk: you have to cross the glacier, where, according to the season, you may find some frozen stretch, therefore we recomend crampons. From the lift, following the trodden track that cross the glacier, you reach in about 20 minutes the place where the track splits in two, a low and a high track. You follow low one til the end of the glacier. You go beyond a rock with fixed ropes (15 meters), than you climb up again and and you reach shortly the Mantova hut. It takes about 45 minutes from the lift to the hut. If you choose the high track (you have to consider the season and the snow conditions), climb up slightly. When the snow ends, you go on a mixed path (earth, rocks and snow) and after a few bends you reach an equiped path. The fixed ropes and steps made with wooden trunks make your ascent of this steep section easier. You reach the top of this path and you see on the left, below, the Mantova hut. It takes about 50 minutes. From Alagna you take the lifts to Passo Salati that consists of two sections: the cableway (first part) to Pianalunga and then the cableway that bring you to the Passo Salati and the lift to Punta Indren (100 meters from the station of Passo Salati cableway). Once reached Indren you follow the same path described above. Otherwise, from Gabiet, following the old path 6a you reach the hut on a very safe and well-trodden path. The last part of the path is on stony ground. 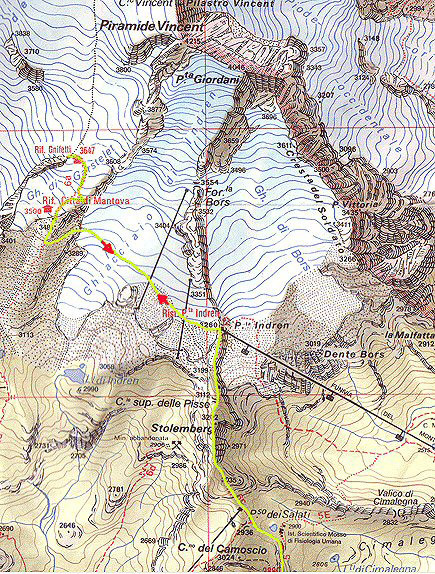 The way from Gabiet to mantova hut takes about 4-5 hours.